It is worth visiting the Durham Mining Museum Site to read the full Mines Inspectors Report on this incident. Derick Pearson explained: ”This photograph was taken to show those associated with the clipping underneath it, and also because it was one of the rescue groups which covered many of the pits throughout the area including the coalfields. My father (Deputy) Dennis Pearson is first left standing on the back row. Next to him is Bob walker who lived at North Skelton at that time. The rest of the team I am certain were from different pits and on this occasion there were teams from 3 other pits. When I say team I mean 2 men teams in this instance. There were teams from Crook, Houghton le Springs and Benwell as well as others to drop back on in the event of a multiple disaster. The reason it was called Crook rescue team was because the rescue teams involved all travelled and practised their rescue methods at the mine at Crook. 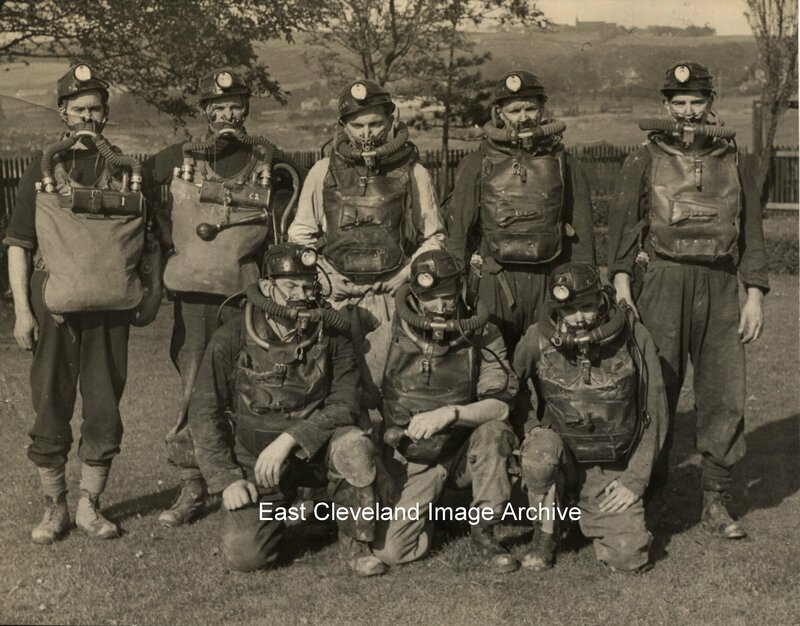 As my Father and Bob were from Kilton Pit the photo always got called “The Crook Rescue Team” by the local lads, hence the name on the back of it. Andrew Turnbull the Mine manager at Kilton Mine used to take my Father and Bob up to crook in his vehicle, a Vauxhall Wyvern or Velox at that time. The Gas explosion rescue mentioned above was already in force before the rescue teams from the outlying Durham pits arrived and men like Rob Johnson and Bill Garbutt acted fearlessly trying to get their own mates out before the other teams came. The man who was killed was Raymond Johnson and was nicknamed ‘Chocolate Johnson’.” Many thanks to Derick for that explanation. Image courtesy of Carlin How Community Centre and from a collection compiled by Derick Pearson in 1983. I actually worked down this mine, starting as a Sprog Boy and the going in-bye the drive a loco. Wild Horses wouldn’t drag me underground again – a dangerous Job!